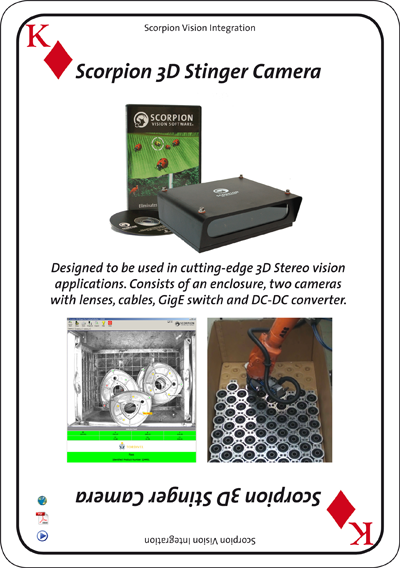 The Scorpion 3D Stinger™ Camera is designed to be used in cutting-edge 3D Stereo vision applications. It is compatible with the latest 3D version of Scorpion Vision Software and locates moving objects in 3D in real-time. The system contains two cameras with lenses, optional structured lighting, power and easy mounting. The unit is fed with 24 volts. The unit is designed to be used in 3D Robot Vision, 3D Scanning and other advanced 3D Machine Vision Solutions. The unit is designed with the highest quality and the design will save man-hours when creating 3D Machine Vision Solutions. The unit is the perfect companion for Scorpion Vision 3D. Scorpion Vision Software can control multiple units from a single PC. The state-of-the art multi-core support in Scorpion Vision Software ensures the fastest and most robust 3D Stereo Vision solutions. The unique one-push 3D calibration technology provided by Scorpion secures optimal performance and easy maintenance. Click to check the Scorpion 3D Stinger Camera datasheet.